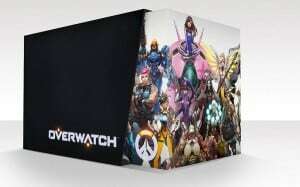 Overwatch Xbox One, PS4, PC Pre-Order Now Available | Nerd Much? We just recently learned that Overwatch was heading to Xbox One and PS4, spoiling Activision Blizzard’s BlizzCon 2015 surprise. Today, at least, the company was able to announce that Overwatch pre-orders are available now, with the release coming in spring 2016. Those who want to put their money down on a copy can head over to Amazon, and copies will undoubtedly be available on Amazon soon. Gamers will be able to purchase the Overwatch: Origins Edition, which comes with five hero skins and a cache of Overwatch-themed content for other Blizzard games, for $60. A Collector’s Edition will be made available for $130, which contains everything in the Origins edition, as well as a full-color art book, the Overwatch soundtrack, and a high-quality collectible statue of Soldier: 76. PC gamers will have the option for a $40, digital only edition. The 6v6 shooter takes place on Earth in the near future, where teams of heroes clash on the battlefield for control of iconic locations around the world. The game has a whopping 21 heroes to choose from at launch, with each hero having their own unique arsenal of weapons and abilities. The game places an emphasis on teamwork, with intense action. On top of the absolutely incredible Warcraft movie trailer, Blizzard also unveiled a brand new Overwatch map called “Hollywood,” which takes players on a movie studio tour. The last three heroes, Genji, D.Va, and Mei, were also announced. We’ll be sure to add Overwatch to our list of the top 23 most anticipated games of 2016.